Whether you’re trying to limit access to a few channels or give younger viewers a remote control they can actually use, Sony’s colorful, durably constructed RM-KZ1 Children’s Remote fits the bill. Assign preferred channels to the seven numbered buttons and prevent dramatic swings in volume with a volume-limiting feature that prevents levels from changing up or down more than three steps within 30 seconds. The RM-KZ1 is small enough to be easily worked by small hands and splash proof for those inevitable accidents. Locked down battery and programming compartments provide extra security. 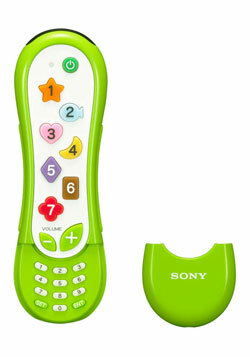 Sony’s RM-KZ1 Children’s Remote Control is currently available at Target Stores and Target.com for about $15.